Mommy This &That: What's In My Bag, Yo? What's In My Bag, Yo? Fadra surprised us all with a Saturday post and she mentioned it was fluffy and light-hearted and instantly I was intrigued. She joined in with Nice Girl and her what's in your bag post. If I have to admit one thing...it is that I am Nosy. That's right with a capital N. But I also don't mind sharing, so here we go! This is my running to the store or heading out without the Boy bag. Don't let the size fool you...I can fit a lot in there! A peek of what it looks like before I empty it all out. It has the essentials and doesn't look so bad, right? Okay, now we are getting somewhere! My essentials: LV wallet (gift from Hubbs), Blackberry, car keys on Tiffany key ring (wow, my Hubbs is Da Man! ), designer sunglasses (scored at outlet!) and mints for nausea and fresh breath. 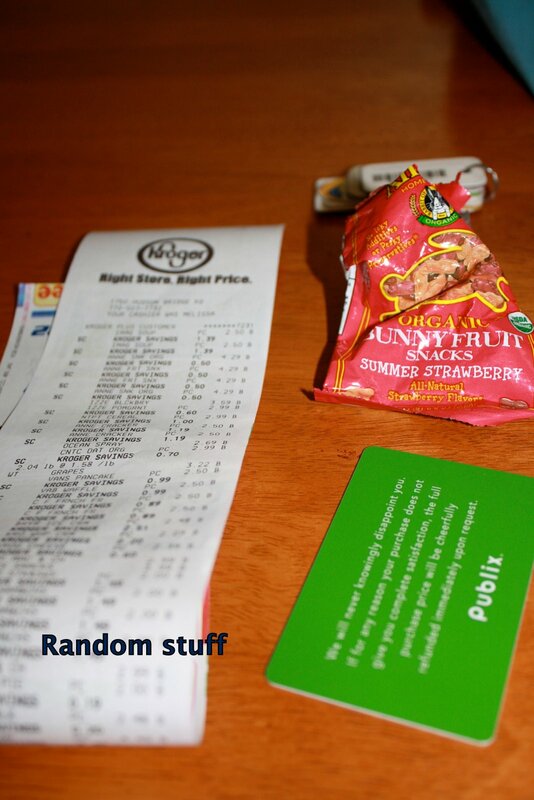 Random items: empty Publix giftcard, receipt from Kroger, empty wrapper from the Boy's snack and all the loyalty/reward cards from all sorts of stores. Exciting, right? The makeup bag: Chanel glossimer, clear mascara, Estee Lauder lipstick, Yes to Carrots berry balm, Bubble & Bee organic chocolate and mint balm, Bubble & Bee organic lotion stick, Aleve bottle (with Tylenol), Clean Well sanitizer, Tide stick, blotting papers, Covergirl eyeshadow, floss, and girly products. So that's it. That's what's in my bag, yo! Do you feel like you know me better? Want to play along? Visit Nice Girl Notes and join in the fun! So you are a BRAND girl, huh? I could have totally guessed the Louis Vuitton wallet. I don't know why. Psychic intuition maybe. And empty gift cards. Why do we keep them? But the most intriguing item? Yes to Carrots lip balm. I must know more! I want everything in your bag. Not lying. Not lying at all.